The best-selling house author of the monastery of Monkwearmouth-Jarrow, the Venerable Bede (c. 672-735) is most well-known for his 'History of the English Church and People.' He wrote a number of biblical commentaries as well, including one on the Catholic Epistles. 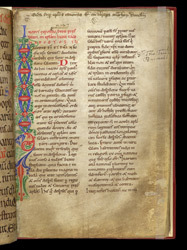 This copy belonged to the library of Durham Cathedral, where his tomb is still located. Most of the copies of Bede's commentaries have restrained decoration because they were made for study rather than display. This manuscript's decoration is certainly not excessive, but the border on one side of the commentary's first page could probably represent the maximum decoration for this type of manuscript in the 12th century. This page has the beginning of the commentary on the Epistle of the Apostle James.